Bull is a nickname given to me quite a while ago. While it is a nickname that I rarely use, I like the reference as part of the blog. I was working with a team of process control engineers in Indiana as a site consultant for VAX VMS administrators. 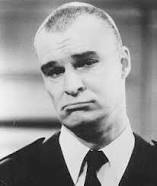 At the time, I was a fan of the TV show “Night Court” and Richard Moll (pictured below). I tended to mimic some of “Bull’s” antics while joking with the team. The administrator gave me the name and my team kept the name alive.